Last week something amazing happened. I’m not normally spontaneous or impulsive. But it was a nice evening and I decided to take the long walk home. That’s not the impulsive part; don’t worry. 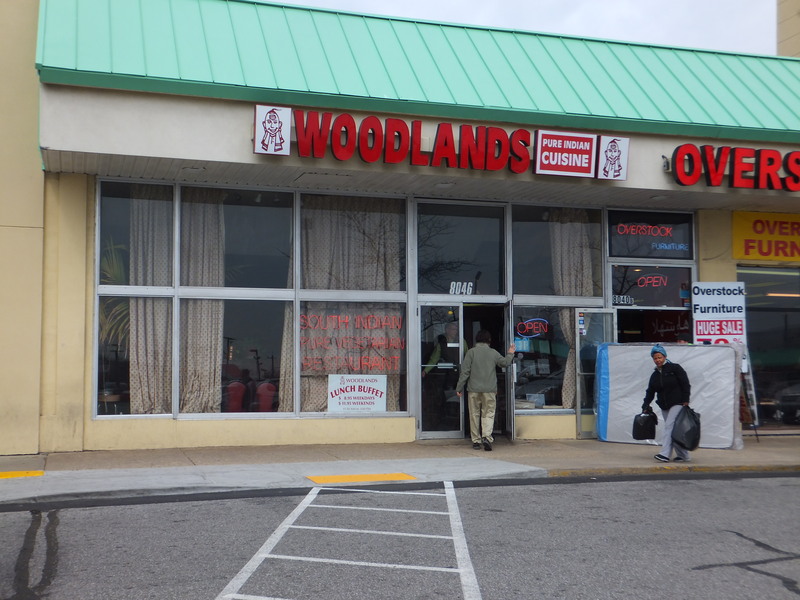 As I passed the Cleveland Park strip mall of Vace fame, I heard some folks gushing about their dinner as they exited the old Bardeo space. I looked up and saw Bindaas. 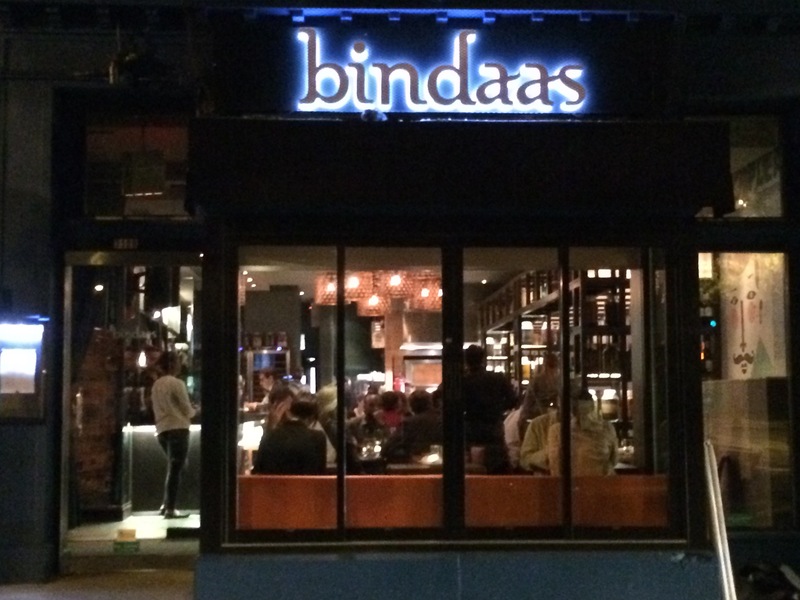 I knew from my days living with Hindi-speakers that “bindaas” was a delightful slang term for “cool and carefree.” Spontaneous, even. 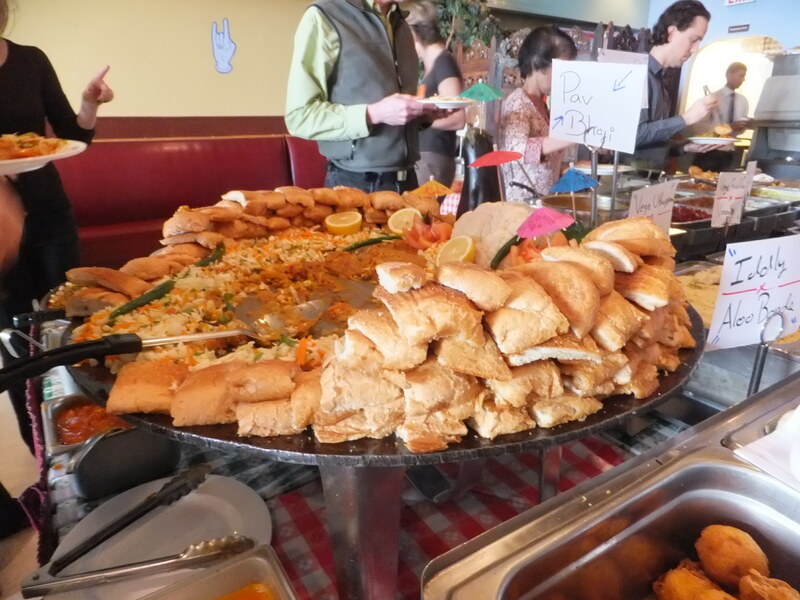 The menu enticed me with familiar yet inventive chaats, khati rolls, and other north Indian street foods. When a quick Google search revealed that Bindaas was a new Vikram Sunderam venture, I was sold. I was going to treat myself. To a fancy dinner. By myself! Only after I sat down at the bar did I recall that of all days for me to splurge in this highly unusual (for me) fashion, it was Treat Yo Self Day! 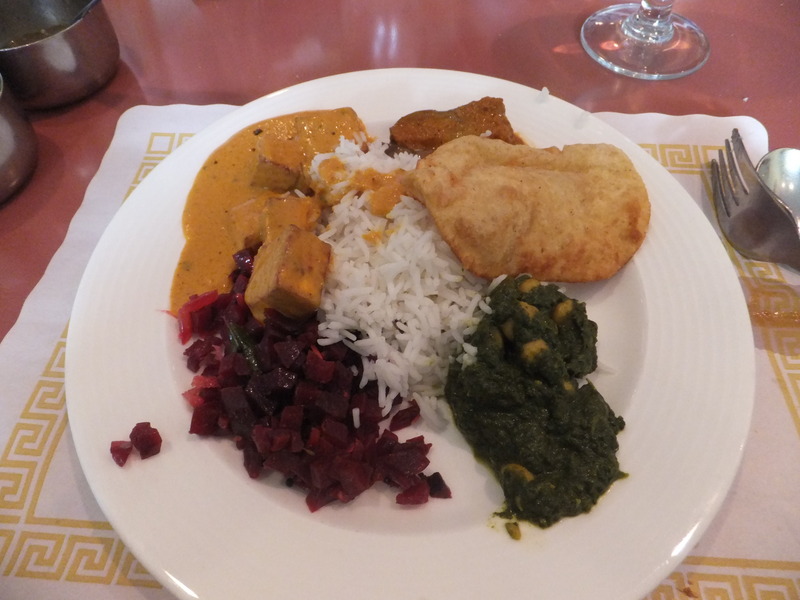 I settled on the vegetable kabob with paneer and the ragda pattice because I cannot pass up paneer or alu tikki. 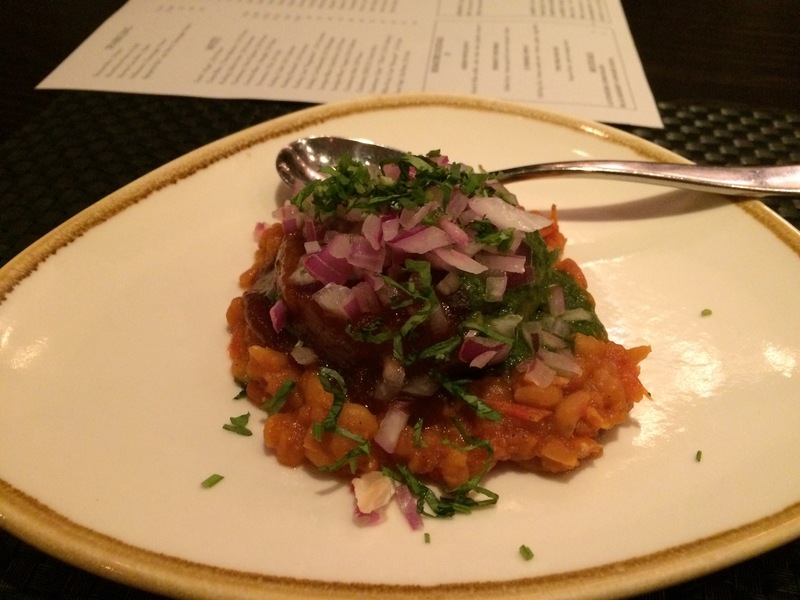 The ragda pattice, a spicy potato patty with soft yellow split peas, cilantro chutney, and minced red onion was a tasty, lively mix of textures. I would have liked it to be a bit less spicy but this south Indian finished it off between gulps of ice water. 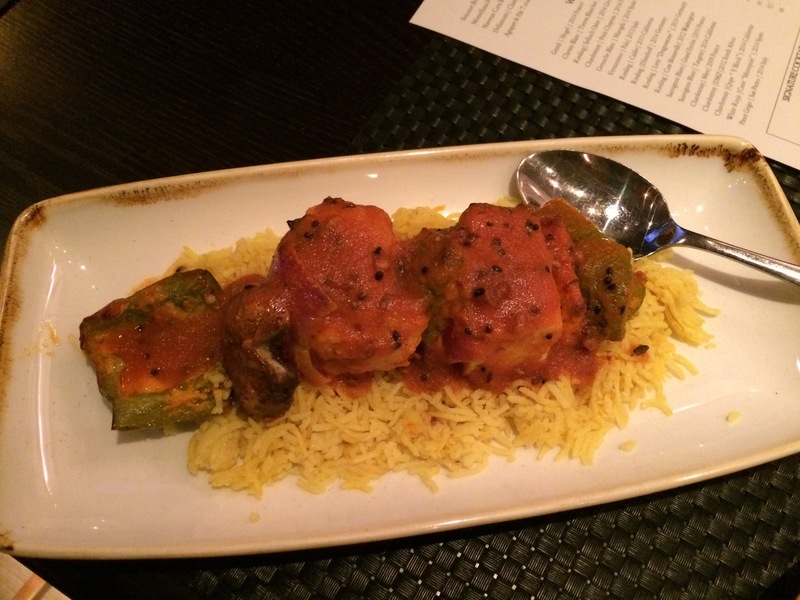 Each element of the kabob was roasted perfectly and well-complemented by the intense tamater kut (a Hyderabadi tomato sauce). I expected the yellow rice bed to be the lemony pulihara I’ve had at the Bombay Club, but it seemed to be just rice with some turmeric. Pulihara would probably not be the best foil for the kut flavors anyway, but I couldn’t help being a tiny bit disappointed. One bite of that roasted paneer and kut though, and all was forgiven. 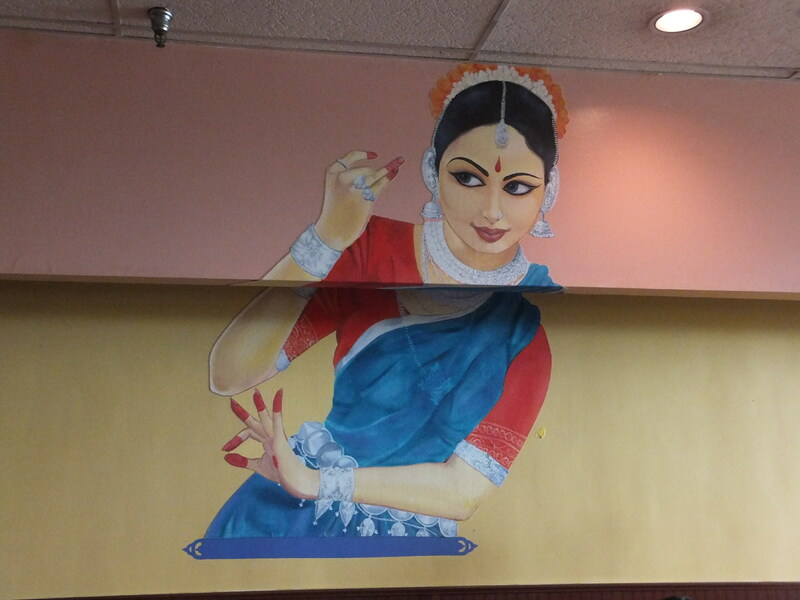 I do hope they consider adding a paneer khati roll. I’ll head back soon to try other veggie dishes like the bhel puri, avocado golgappa, and pao bhaji, and perhaps a dessert if Meera joins me! 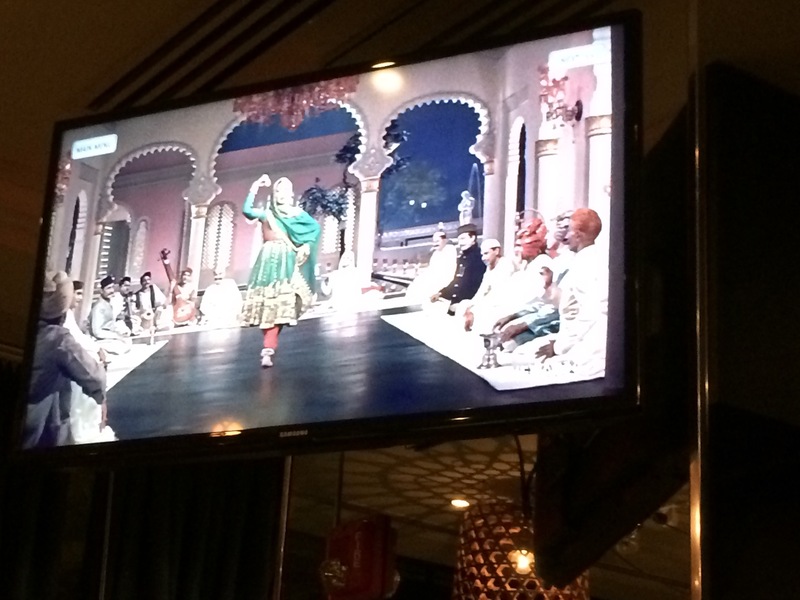 All in all, Bindaas was an unexpected indulgence. So live a little! 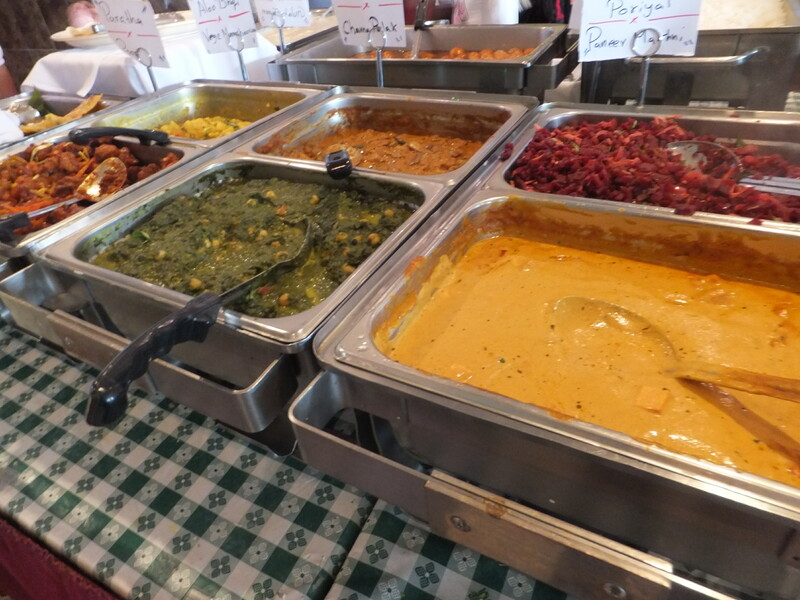 Grab some friends and sit down to some Indian street food on Connecticut Avenue. 1. Gourmet-indulgence: like Pizzeria Paradiso – crust has well-developed flavor, buffalo mozzarella, premium tomatoes, basil. 2. Gourmet-healthy: like I make at home – hearty whole wheat crust, may involve tofu and/or broccoli, sharp cheese. 3. 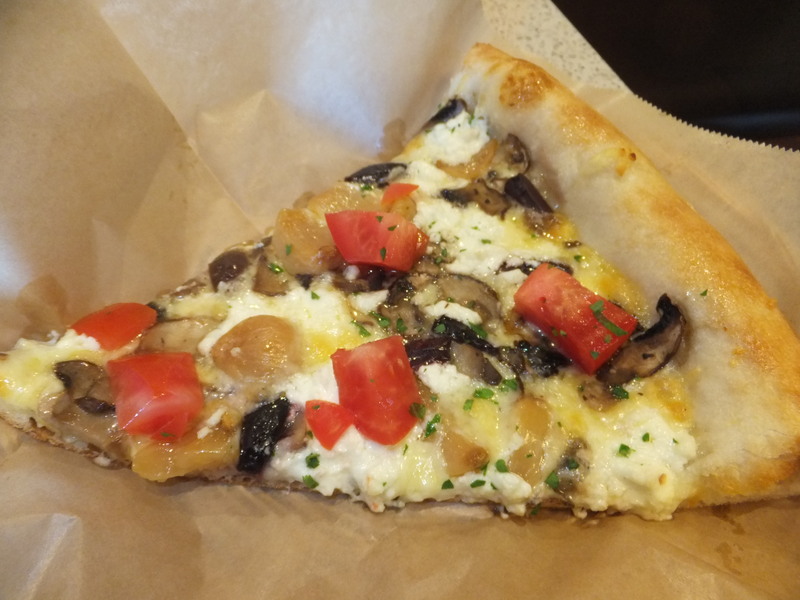 The Slice – a rather large wedge of thin-crusted, uniformly topped, cheesy goodness. 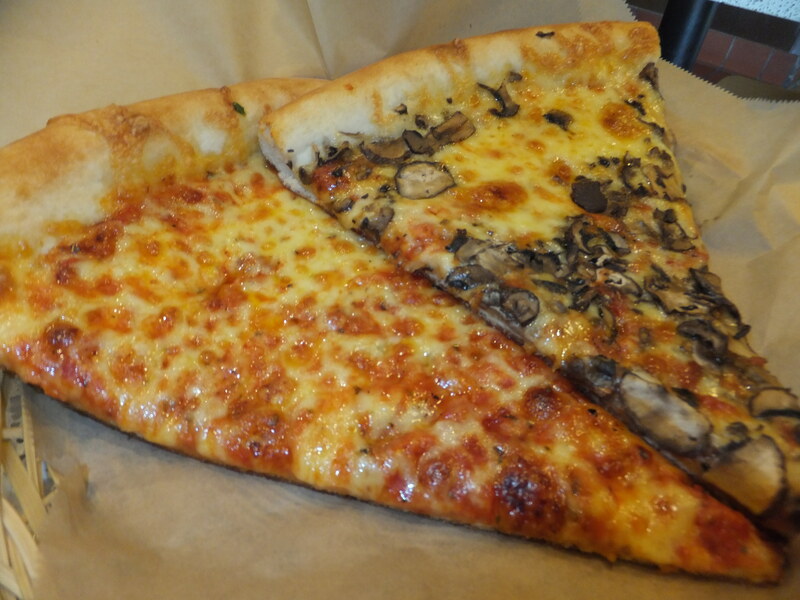 One or two slices and you’re done, depending on size. 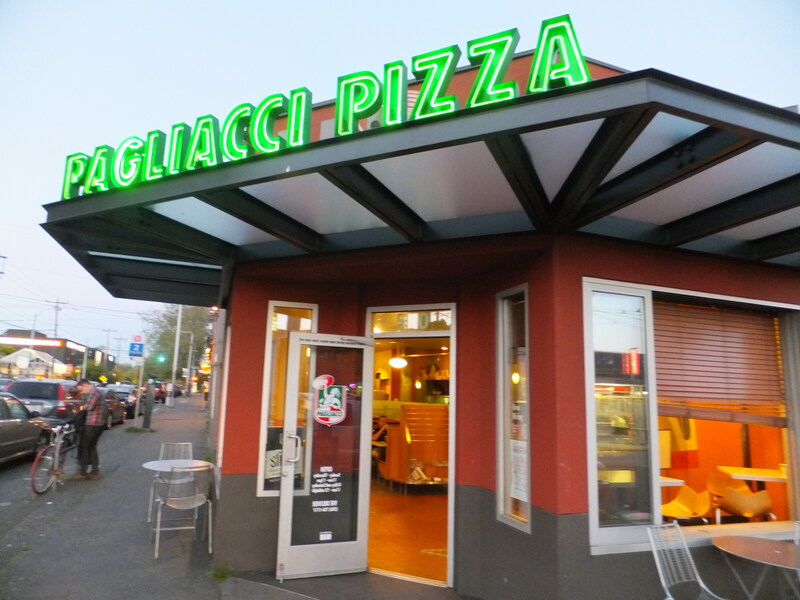 Pagliacci’s offers a happy-medium crust that’s both thin, chewy, and crispy, and plenty of savory, cheesy goodness. I’d already devoured these and felt pleasantly full when the friendly guy behind the counter came by and started chatting with us. When I told him that yes, indeed I was vegetarian, he got this look in his eye and started describing a pizza he thought I absolutely MUST have. It was the AGOG Primo™ with mushrooms, roasted garlic, goat cheese, Kalamata olives, fontina, mozzarella and parsley on olive oil with tomatoes added after baking. It’s normally made only on certain days of the week but you can ask for it any day. Just do it. The combination of garlic (and they somehow avoided burning the already-roasted garlic during baking), veggies and cheeses might merit its own subcategory: the Gourmet Slice. I was sad that I only had room for one of these mind-blowingly good slices, which means I’ll just have to go again. I really appreciated that the pizza guy himself was excited about this veggie pie and the attention to detail (adding the tomatoes and parsley post-bake) was a nice touch. 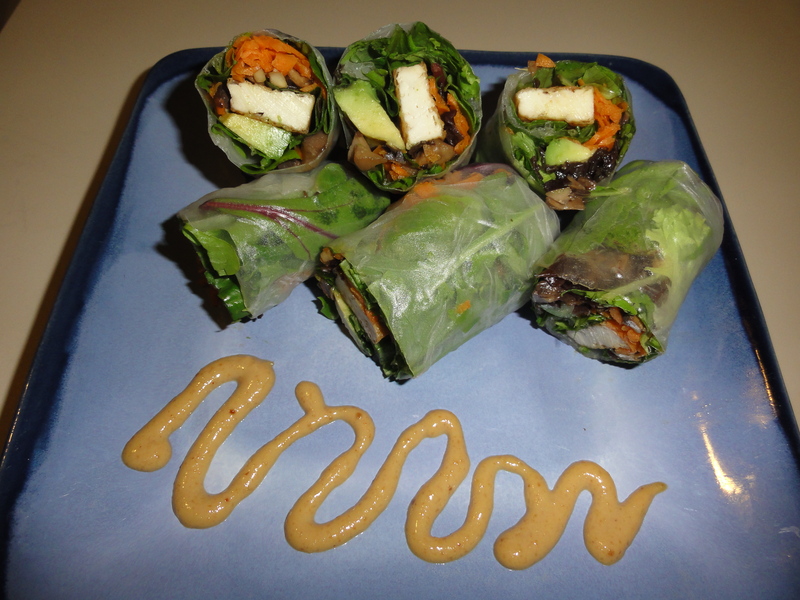 Rice Paper Wraps: Roll up some healthy summer fun! Meera and I have tried every version of the vegetarian summer roll/garden roll/rice paper roll that we’ve found at a restaurant. The fillings vary widely: some combine tofu or fake meat with tasty herbs and greens; some phone it in with just bland rice noodles and bean sprouts. No one roll had all the goodies we wanted, so one summer we decided we would just have to do it ourselves. And oh, the rolls we’ve rolled! 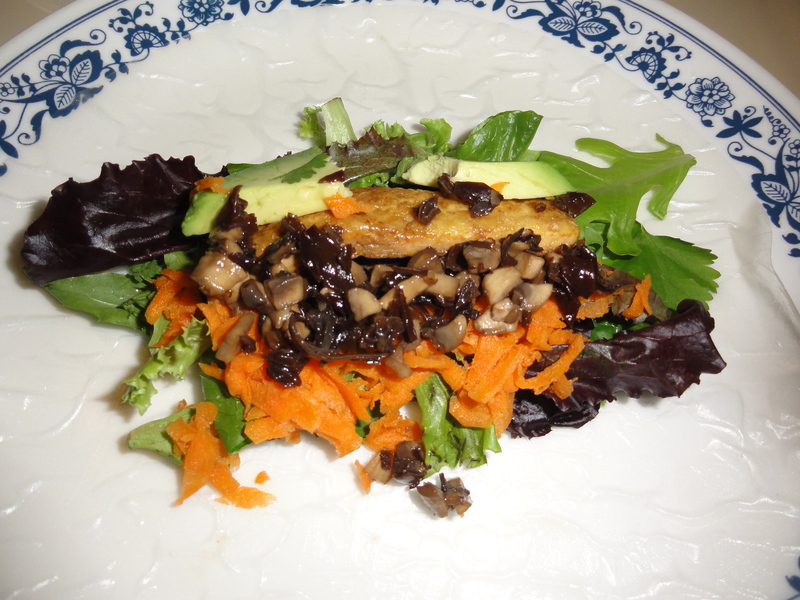 We fill our rice paper wrappers with sauteed tofu and mushrooms, salad greens, shredded carrots, avocado, basil, mint, and cilantro. After several attempts, we have also concocted the perfect savory peanut dipping sauce to accompany these healthy treats (and we’ve taken to putting some inside the roll too). Yum! 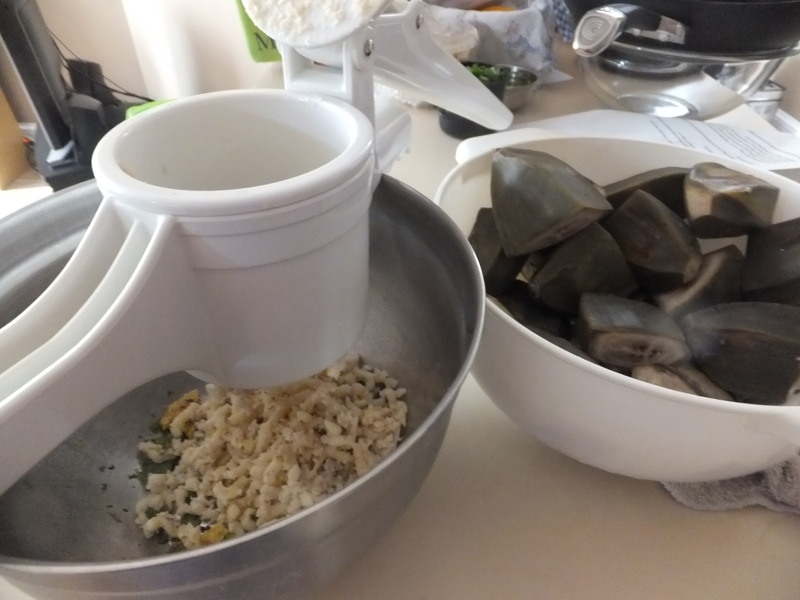 Forming the rice paper rolls is a knack you’ll develop by your third or fourth roll. Don’t be sad if your first few rolls break or the contents fall out; they will still be just as tasty. The whole process is pretty quick, too – don’t be daunted by the long list of ingredients. You’ll likely end up with leftover filling ingredients, but everything can be tossed together to make a tasty salad. 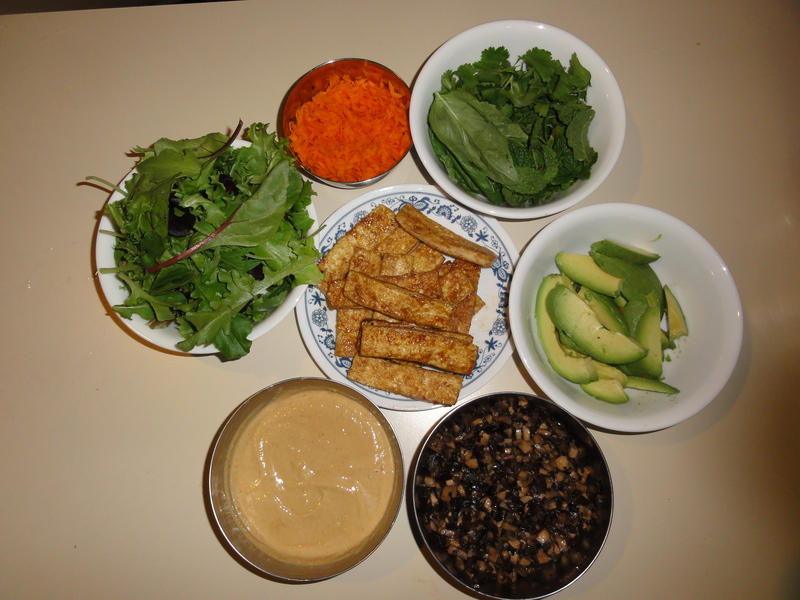 The tofu is especially great to add to a salad or just munch plain! Place all ingredients except water in blender and blend until thoroughly mixed. Adjust salt and soy sauce as needed and blend to combine. Freezes well. 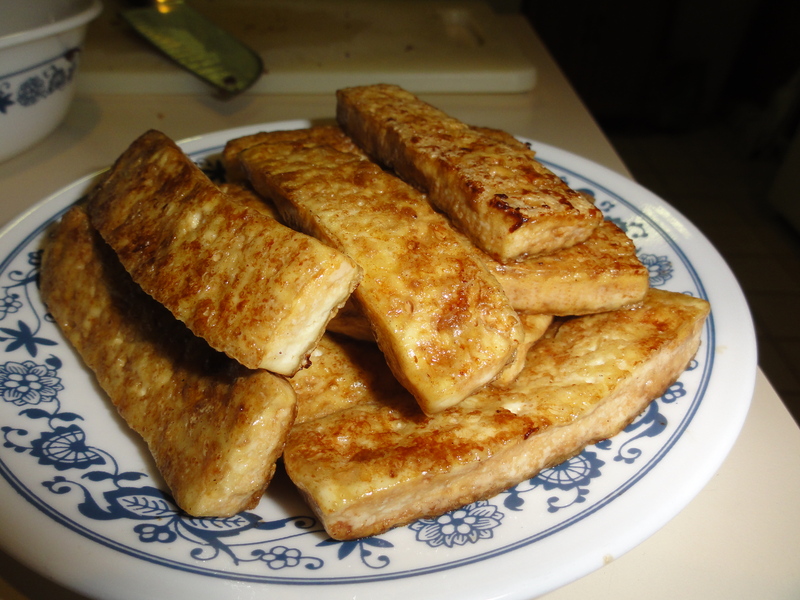 Tofu: Gently squeeze any excess water from tofu by pressing between clean kitchen towels. Cut into 1/4-inch slices, cut again lengthwise and pat dry. 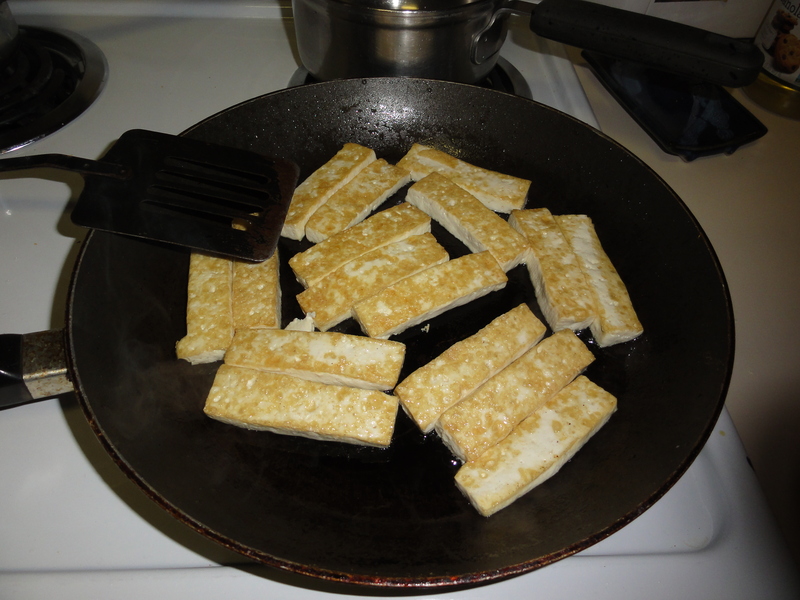 Heat about 2 tablespoons of oil in a skillet on medium-high heat and arrange the tofu pieces in a single layer. Turn when bottom side is light golden and let the other side fry. Drizzle with about 1 1/2 tablespoons of soy sauce, toss to coat and remove the slices to a bowl. 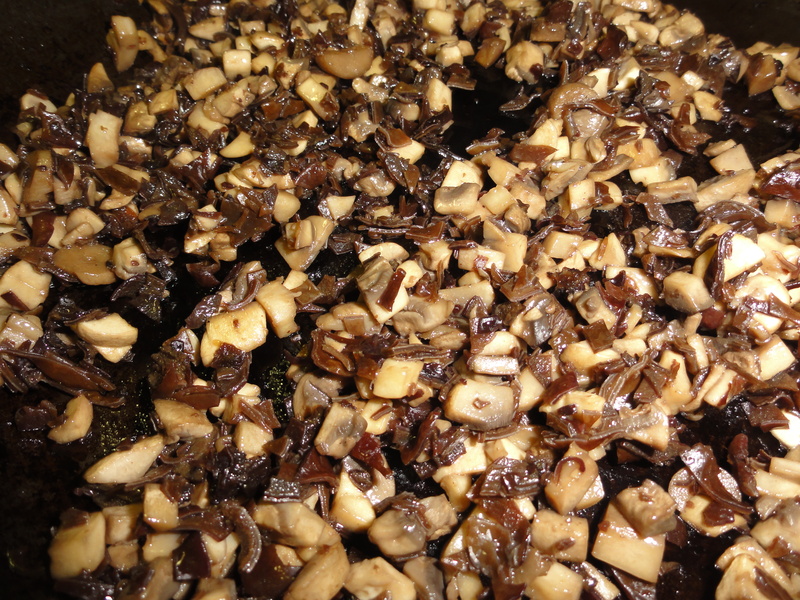 Mushrooms: Clean and chop mushrooms small, then add to the skillet after removing tofu. Saute, stirring frequently, until soft. Add remaining soy sauce to taste. Put all the components in separate bowls/plates on your counter. Closer to you, place two dinner plates, one with water in it and one lightly coated with oil. 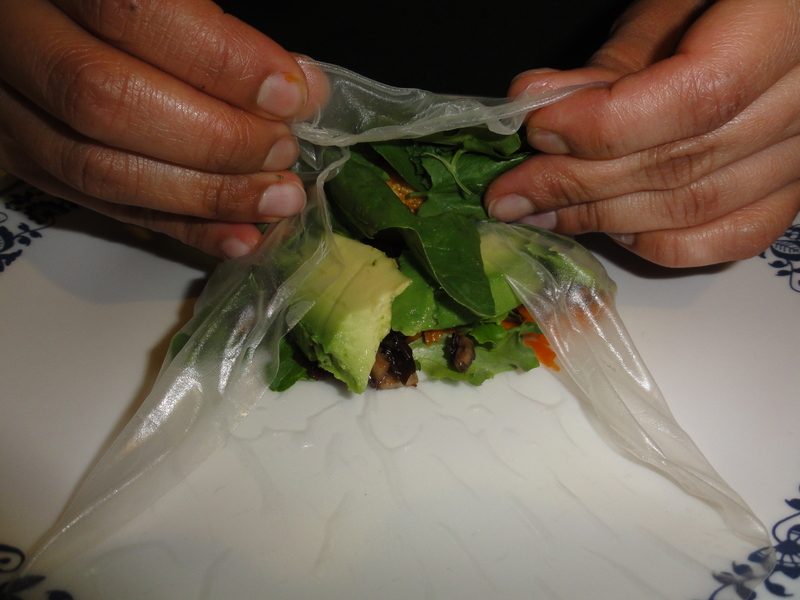 Take a wrapper, dip it in the water, shake off the excess, then lay flat on the oil-coated plate. In the middle of the lower third part of the rice paper, place a few salad leaves, a small amount of each of the rest of the fillings (spread peanut sauce on the tofu pieces if desired), and then a few more salad leaves to cover (this prevents ingredients from poking through the wrapper). Fold the right and left sides towards the middle, and beginning with the side nearest you, tightly roll the wrapper away from you. Use your fingers to push the contents into the roll towards you as you roll. There’s a good description of the process here too. Makes 12 rolls, serving 5-6 as an appetizer or 2-3 as a main dish. 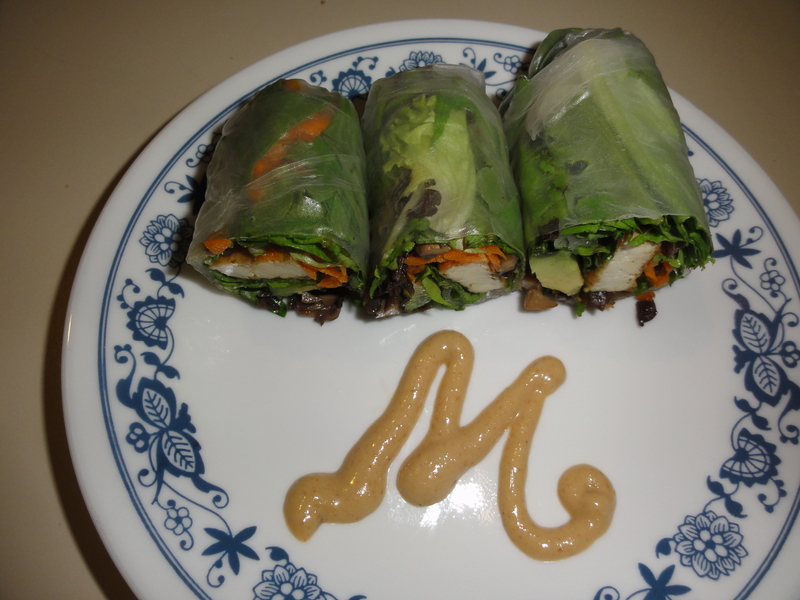 If you’re serving the rolls to someone special, you can personalize her plate with peanut sauce. 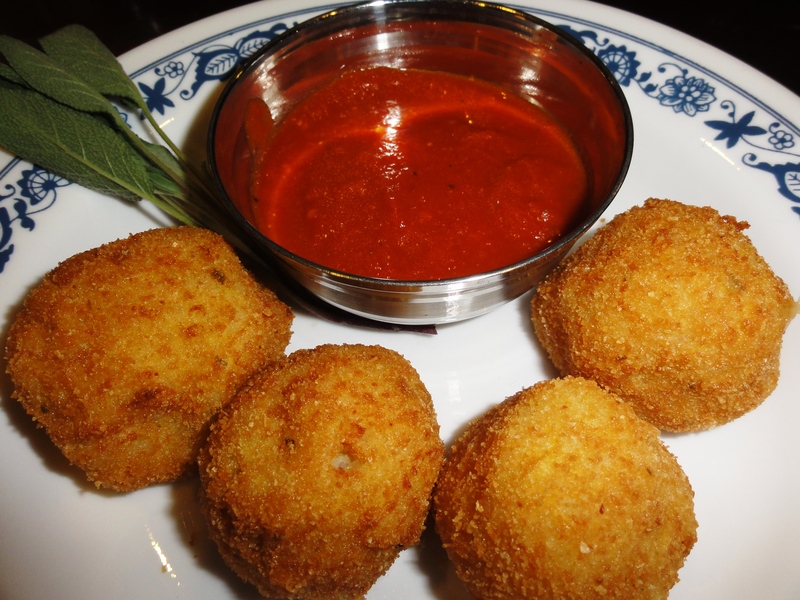 Remember our post on the amazing risotto balls (suppli al telefono, aka arancini) at 2AMYS? 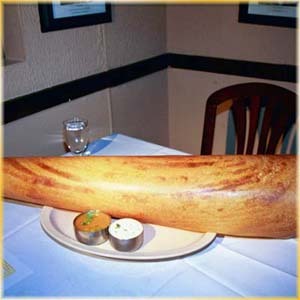 Well, 2AMYS is pretty far from me and I realized I needed to eat suppli more often. And so do you. Plus, I had heard from various Italians that making the balls was really very simple. Arancini have been appearing regularly at my house ever since I got into a) making risotto and b) deep-frying. Now, now, don’t run away just because I said deep-frying. If you do it right, meaning you use the right oil at the right temperature, deep-frying is not all that bad for you. If you’re afraid of oil splattering everywhere, get a good deep-fryer like this one from De Longhi. Even if you don’t eat fried foods that often, wouldn’t you rather fry what you do eat yourself? It turns out that these yummy, impress-your-guest treats are disturbingly easy to make. You can even throw in bits of stale bread or leftover plain rice (add some salt if you do this) to use up other leftovers. The cheese goes in. Smaller (like 1/4″) cubes work best. 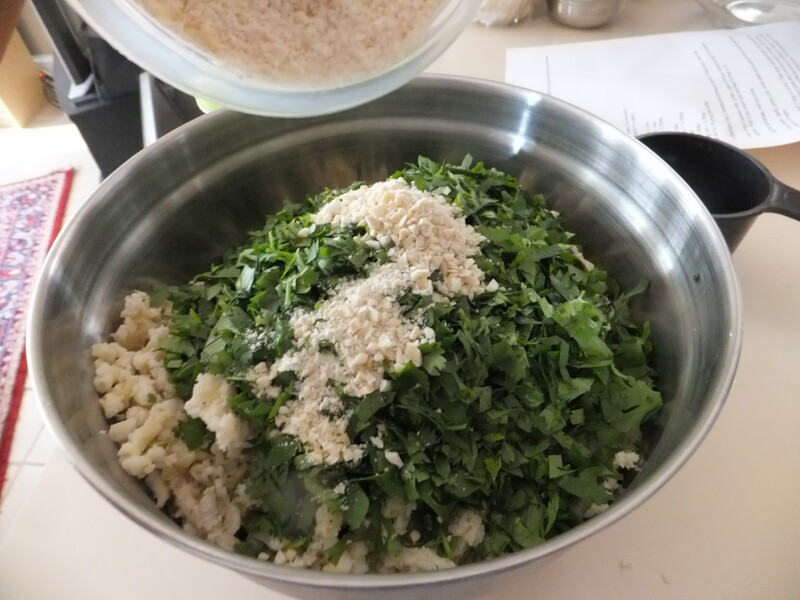 Put 1/2 cup of the breadcrumbs in a bowl and set aside. Line a baking sheet with wax paper so you have somewhere to put the balls as you form them. 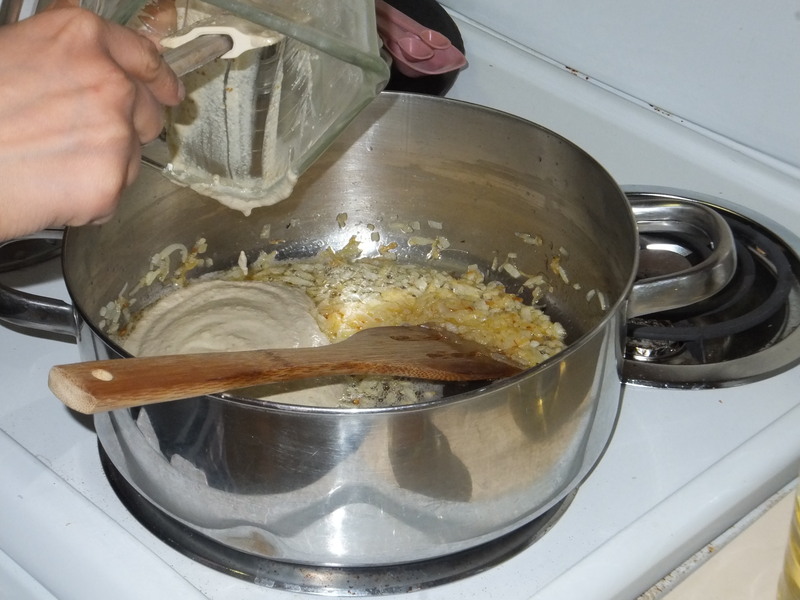 In a medium bowl, use your hands to mix the remaining breadcrumbs and beaten egg into the risotto. 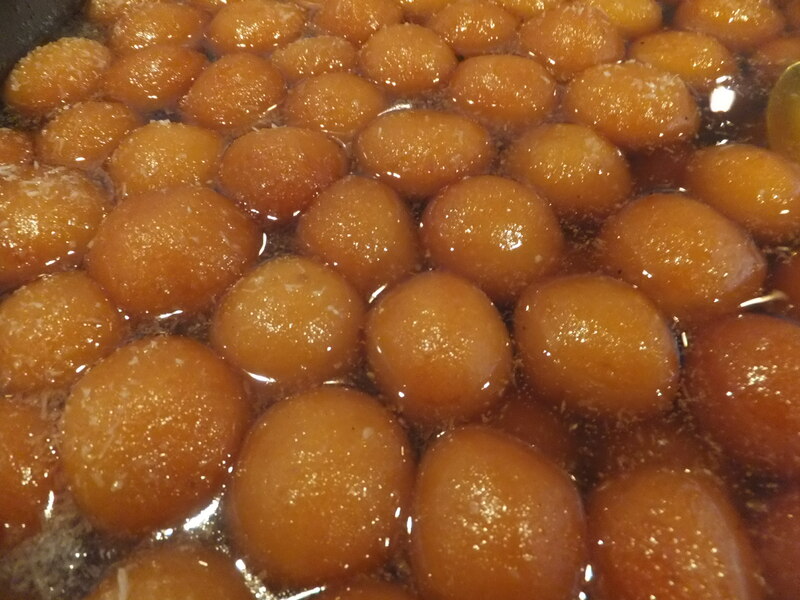 Heat oil to 375 in a deep-fryer or on the stove with a candy thermometer. 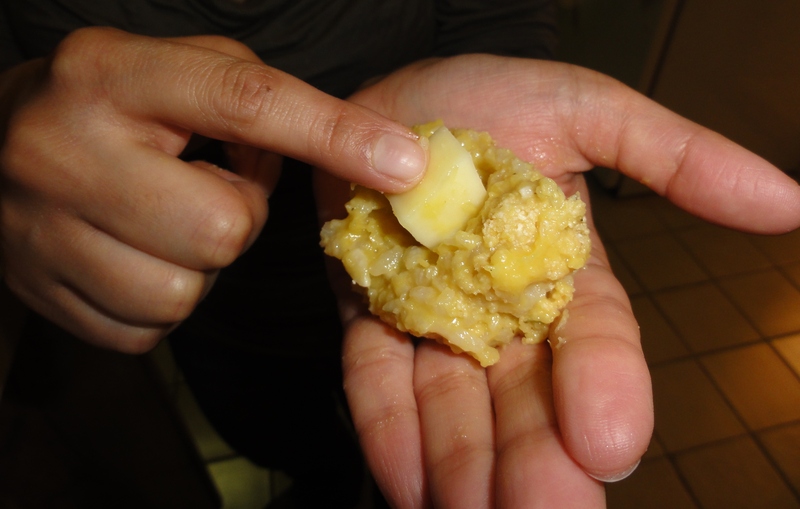 Take a golf-ball-sized amount of risotto and put a cube of cheese in the middle. 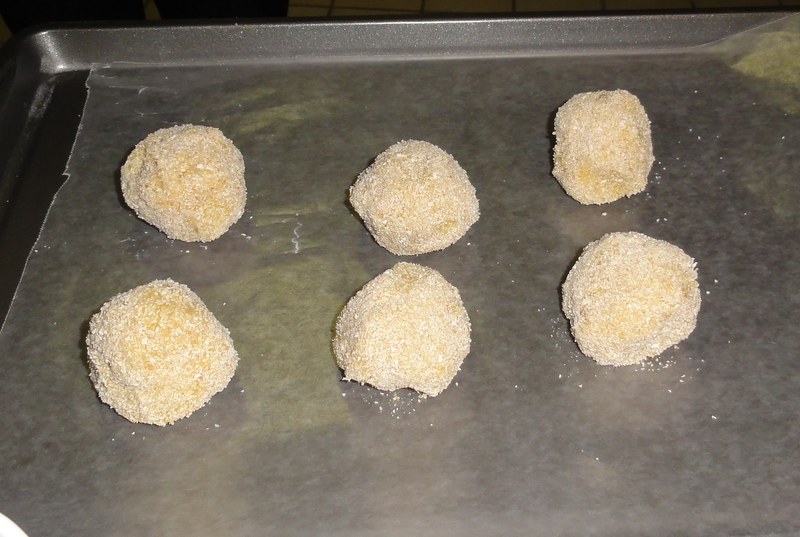 Roll to form a ball, then coat with reserved breadcrumbs. Repeat until you’ve used up all the risotto, placing coated balls on the wax-paper-lined baking sheet. 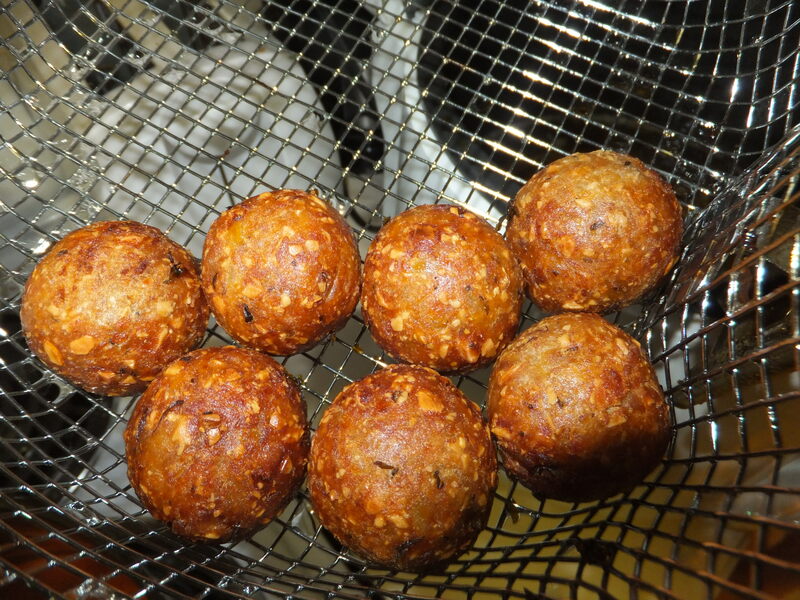 Deep-fry the balls, about five at a time, for five minutes per batch. Serve with hot marinara sauce for dipping. 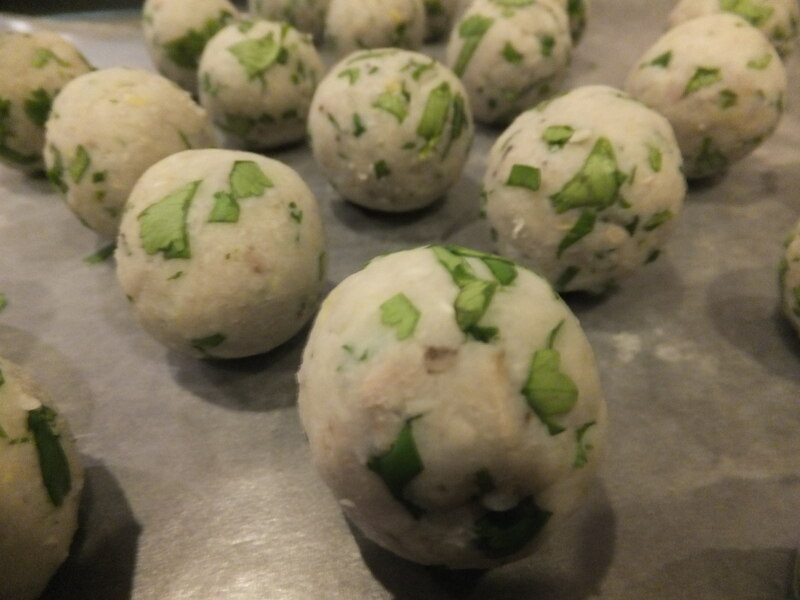 This recipe makes about 20 balls, serving 5-6 as an appetizer or 2-3 as a main dish. 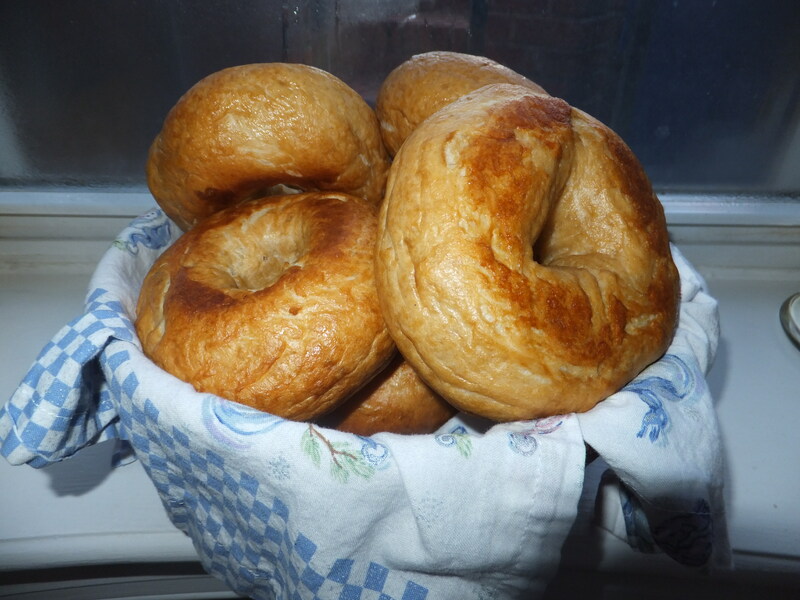 Bagels – yes, you can! 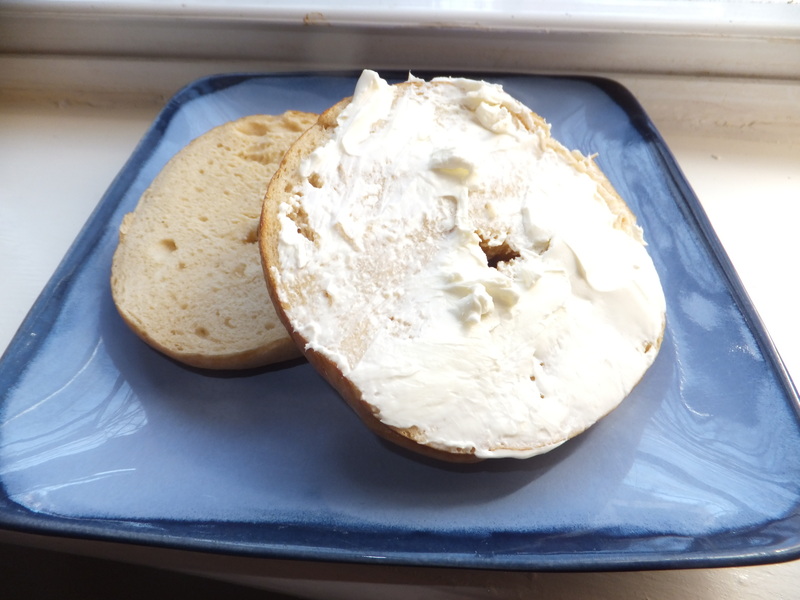 Surprisingly, people always find it surprising that I make my own bagels. 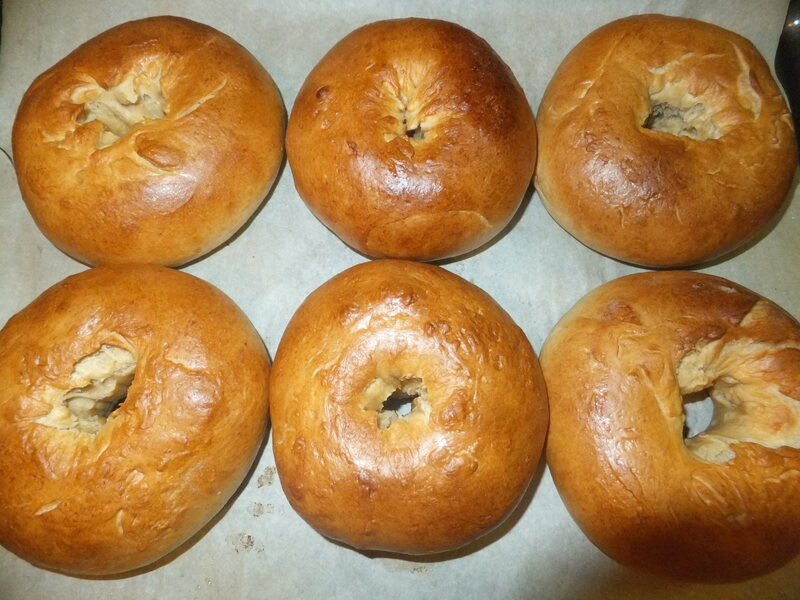 However, for both veteran and novice bakers, bagels are among the easier yeasted breads to make. The process is both incredibly foolproof and fun. You may never want to buy bagels again once you try these. It’s about a 3-4 hour process (with a lot of waiting time) but you can spread it out over two days. Slice and freeze any leftovers for a convenient breakfast treat! One note – barley malt syrup, while optional, does give a delightful flavor and color, especially to the crust. 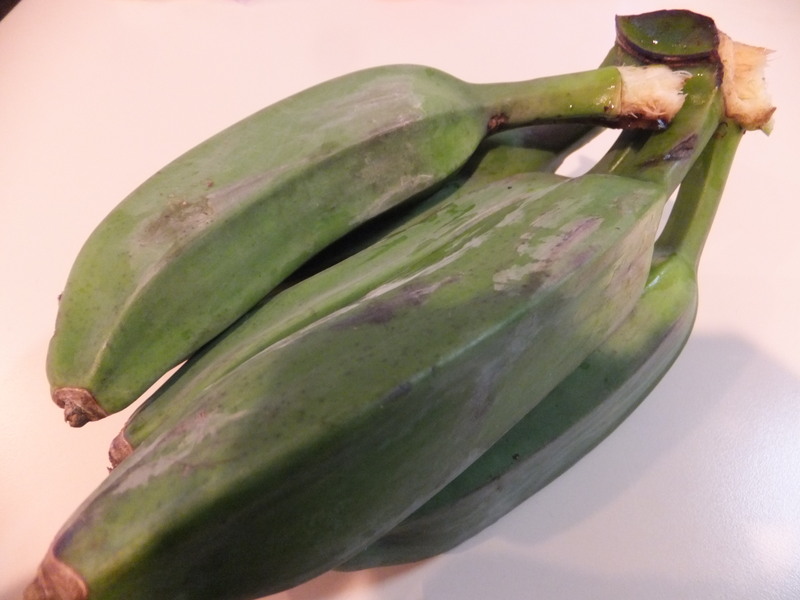 I’ve seen it at Whole Foods as well as TPSS Co-op and other health food stores. Mixing the dough is easiest with a stand mixer or bread machine, but can definitely be done by hand (with the benefit of stress-relief). If you’re using a mixer or bread machine, just put all the dough ingredients (but only 7 of the 8 cups of flour) in there and mix/knead, adding more flour as necessary, until you have a smooth, rather stiff, non-sticky dough. If you’re doing it by hand, mix the dry ingredients together in a large bowl, make a hole in the center and add the wet ingredients. 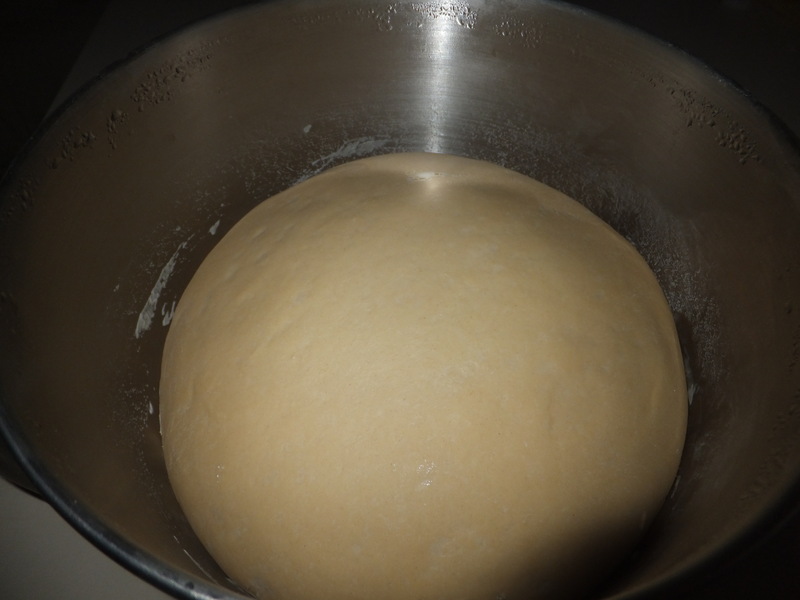 Stir with a wooden spoon until you can’t stir anymore, then get in there with your hands and KNEAD that dough. When it becomes a ball, turn it out onto a floured surface and knead, adding flour as necessary. At the end of all of this, it should look like a satiny-smooth ball of awesome. At this point I put the dough in a big bowl, cover with plastic wrap and put it in the fridge to rise overnight so I can make fresh bagels in the morning. Otherwise, just let the dough rise at room temperature for one hour. Cover two baking sheets with parchment paper and lightly oil it. Divide the dough into ten equal pieces (I use my beloved kitchen scale for this). 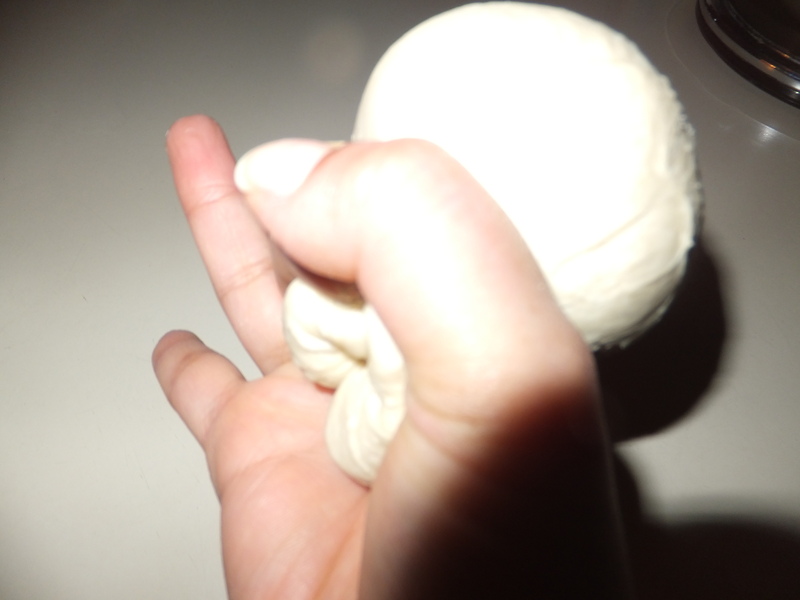 Take each ball of dough and choke it on one end with your thumb and index finger, then stuff the rest of the dough into the little balloon you’ve made. Poke a hole through the center of the ball to create a donut shape. 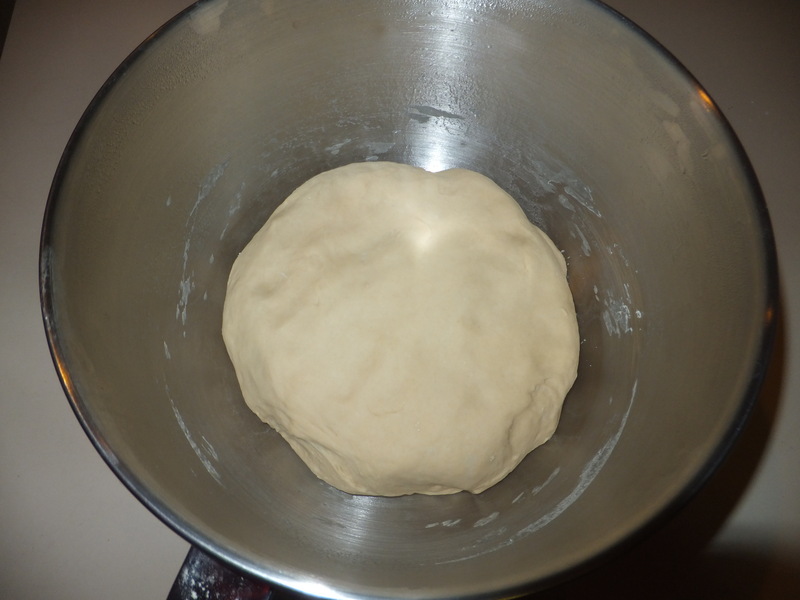 Holding the dough with both thumbs in the hole, rotate the dough with your hands, gradually stretching it to create a hole about 2 inches in diameter. The hole will get smaller during boiling and baking. I also found this guide to be pretty helpful. Reinhart now wants you let the bagels rise again, but I like mine dense and chewy so I don’t. If you want to, just cover them with a damp tea towel and leave at room temperature for about half an hour. Preheat your oven to 450°F. Mix poaching liquid in large pot and bring just to a boil. 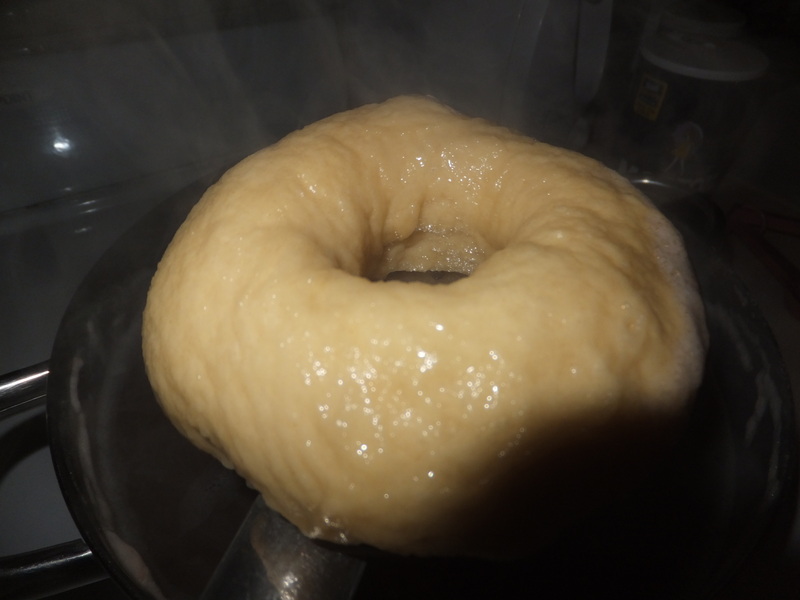 Drop the bagels, two or three at a time, into the liquid and allow to simmer about one minute on each side. Transfer back to the baking sheets with a slotted spoon. Bake for 8 minutes, then carefully flip each bagel over, rotate the pans and bake another 8-12 minutes. Cool on a wire rack for at least 30 minutes (or as long as you can stand it) before slicing or serving. Makes 10 bagels. 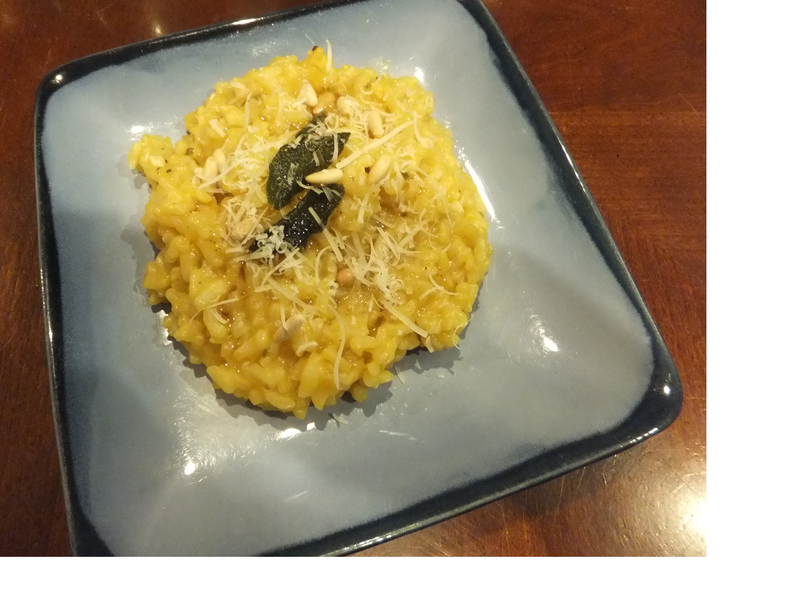 Pumpkin Risotto – Bring on the leftovers! Spring has officially sprung, but we haven’t quite seen our last chilly evening here in DC. The other day I was craving a plate of something warm and comforting when I realized I still had a good bit of homemade pumpkin puree in my freezer from this past fall. 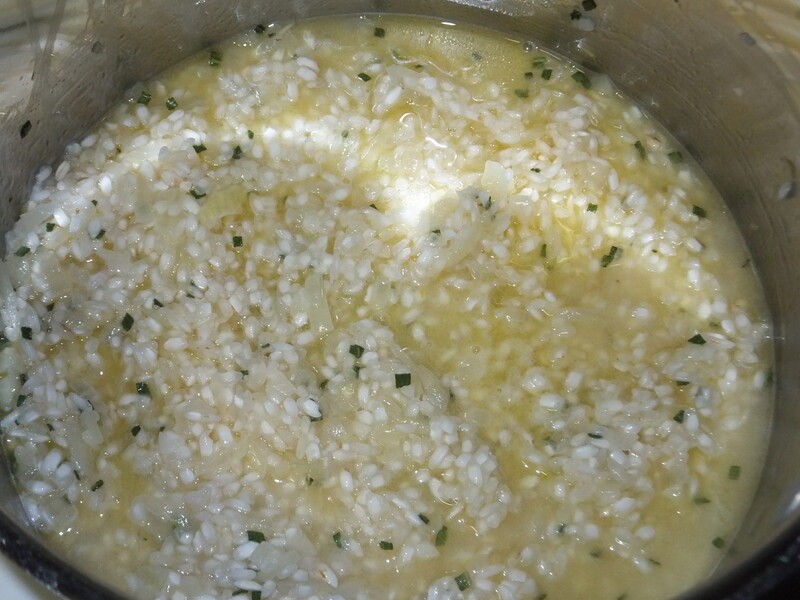 This pumpkin risotto I made up filled the bill nicely and set the stage for some fabulous risotto balls (post coming soon). Heat olive oil and 2 tablespoons of the butter in a heavy-bottomed medium saucepan over medium heat. Add the onion and sauté until softened, about 5-7 minutes. Add the garlic and continue to sauté for about 1 minute. 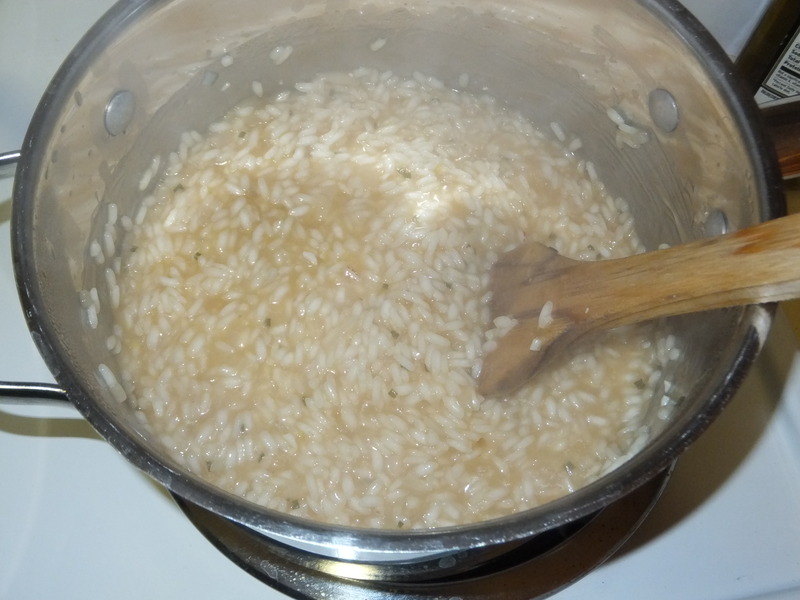 Stirring constantly, add the sage and rice and cook for another minute. Add the wine and cook, stirring often, until the wine is absorbed, about 2 minutes. 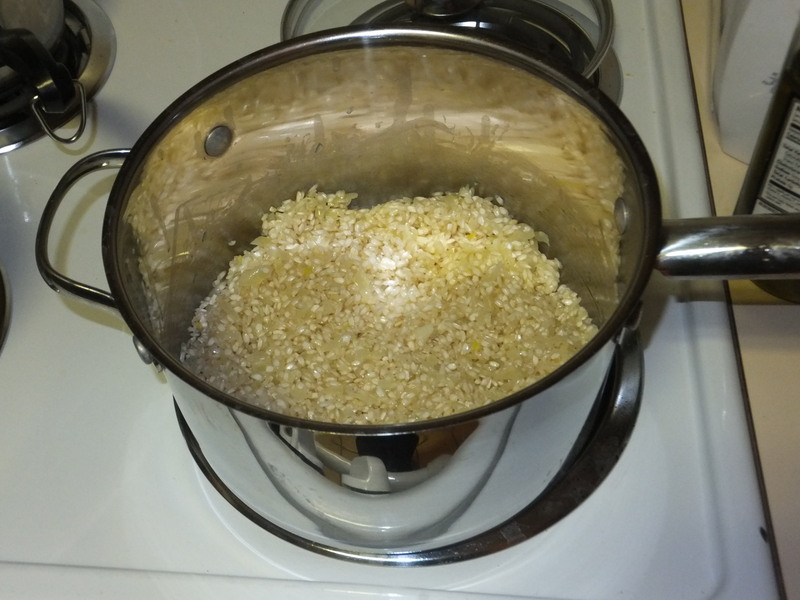 Add 2 cups of stock and cook, stirring all the way, until the rice absorbs the liquid. Repeat, one cup of stock at a time, stirring until it’s absorbed. 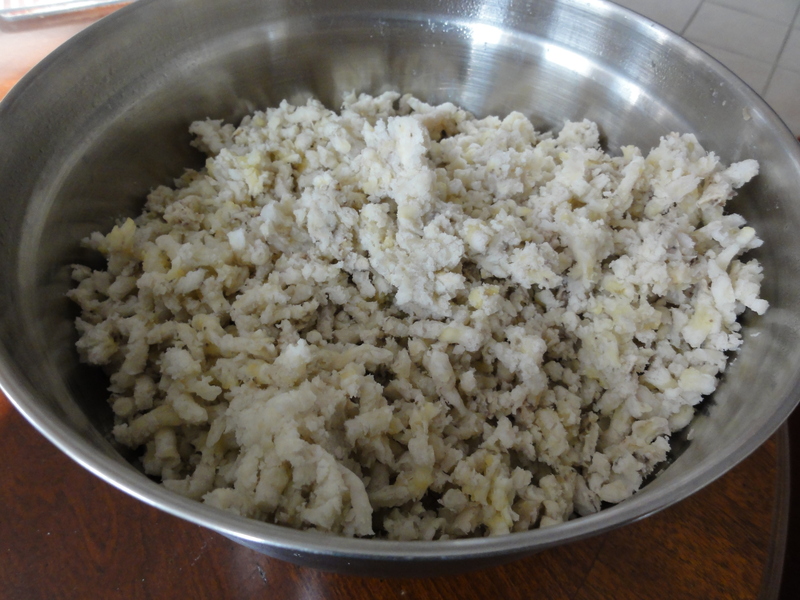 You want the rice to be cooked all the way through, but each grain should be intact and a bit al dente. This will take about 25 minutes in total. Remove the saucepan from the heat and stir in the pumpkin, cheese, sage, salt, nutmeg, pepper, and remaining 2 tablespoons butter. 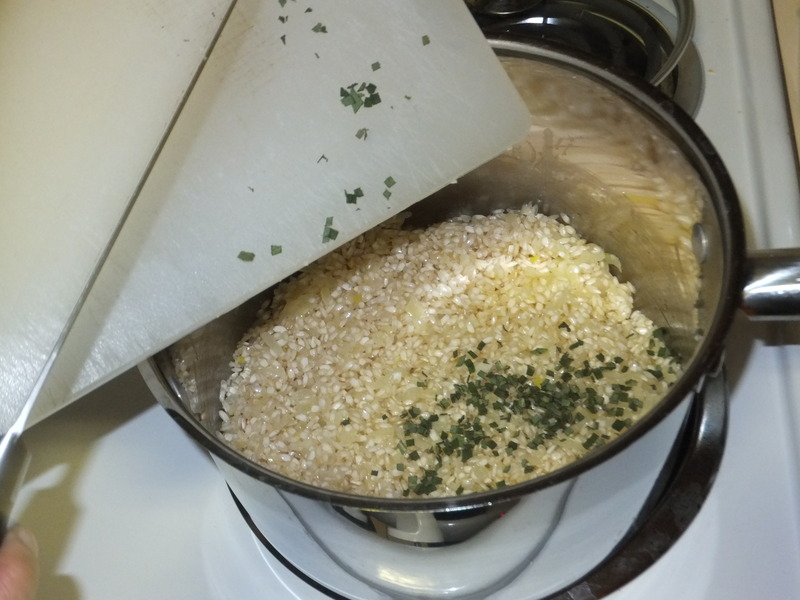 Keep stirring with the wooden spoon until the butter melts, then add salt and pepper to taste. Serve garnished with sage brown butter and pine nuts if you like, and sprinkle on extra Parmesan at the table. Serves 8 (but you’ll want to make risotto balls with any leftovers). So I’ve come down with whatever it is that’s going around (again). But this time, it’s personal. I’m attacking the virus from all fronts – drinking plenty of tea, aggressive sleeping, and, of course, enjoying some healing foods. For me, that means chaaru (Telugu) or rasam (Tamil). In a small saucepan, dry-toast the yellow split peas over medium-high heat until you can smell them, stirring constantly. 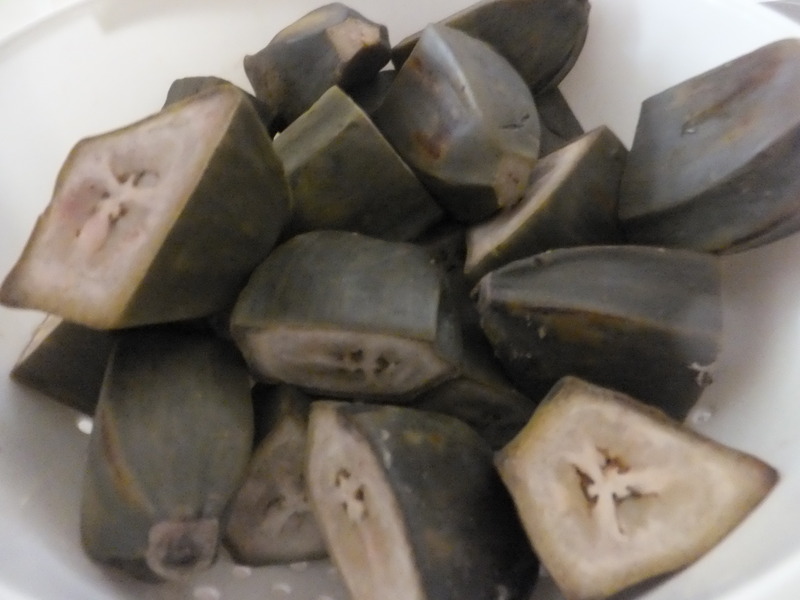 Add water and bring to a boil, then reduce heat and cover until very soft, about 45 minutes. 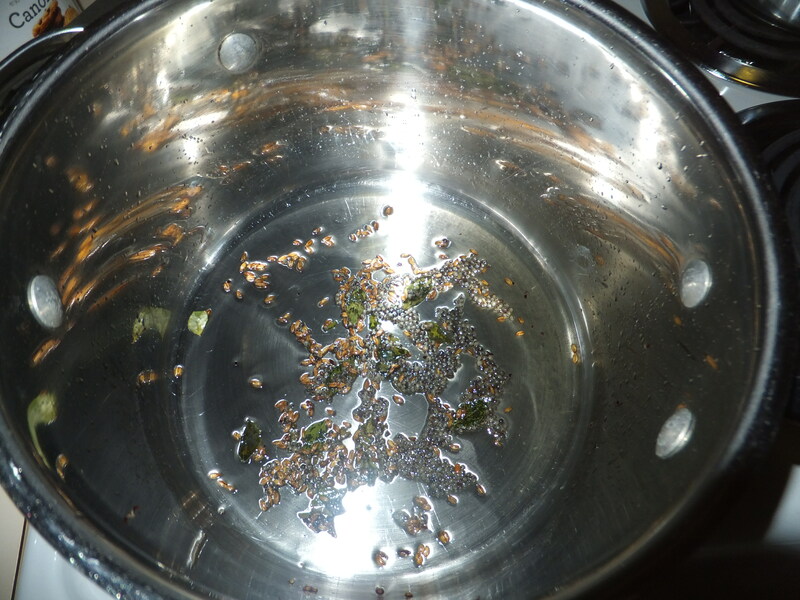 In a heavy-bottomed pot, heat oil on medium-high and sprinkle mustard seeds uniformly over the bottom of the pan. Cover the pan and listen for the moment when the sound of popping slows down, then add the cumin seeds and curry leaves (if using)and remove from heat. 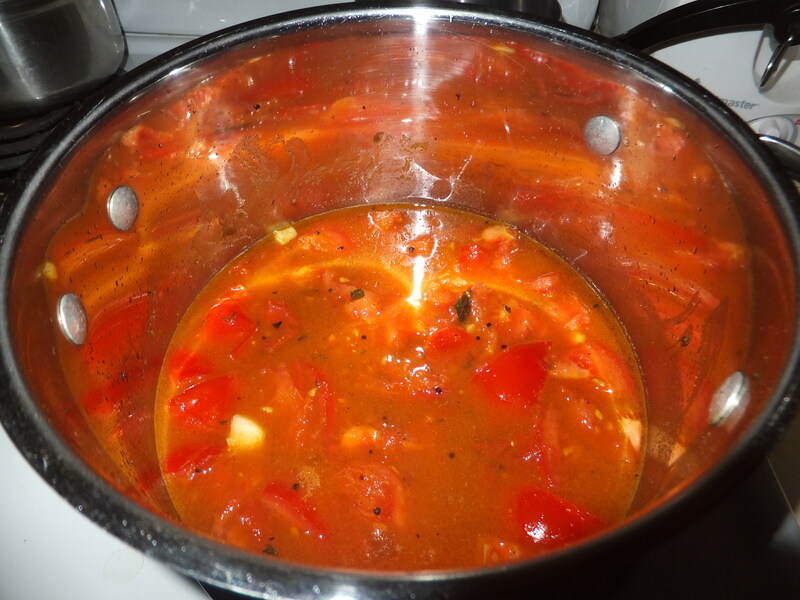 Add tomatoes, garlic, cumin, black pepper, cayenne, and turmeric. 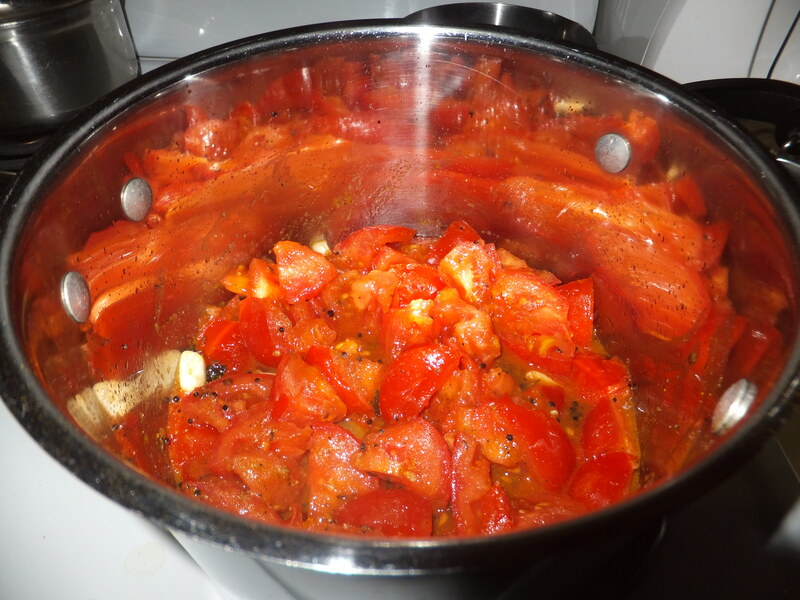 Return to medium-low heat, cover, and cook until tomatoes are soft. Add tamarind (or lemon juice), water, salt and cooked yellow split peas. Simmer for another 5 minutes and garnish with cilantro leaves. 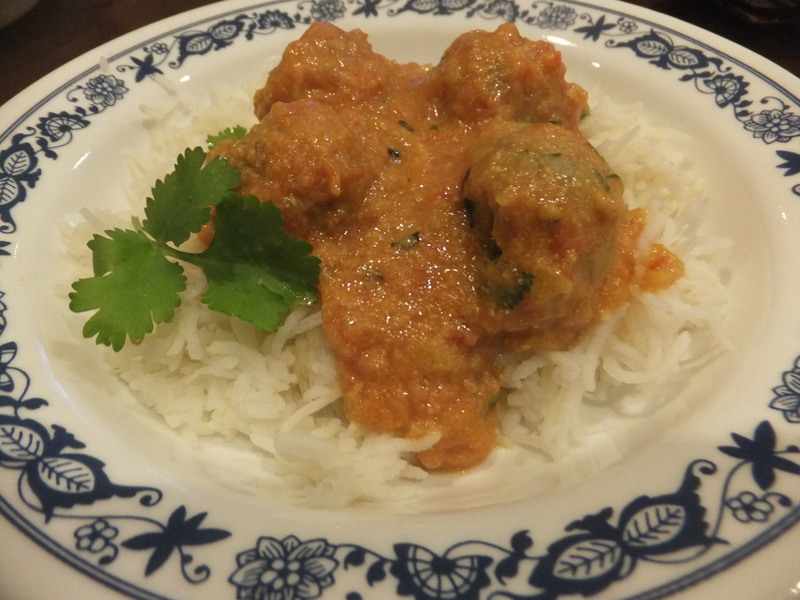 Serve with about 1/4 cup cooked rice per person. Makes 4-6 servings. 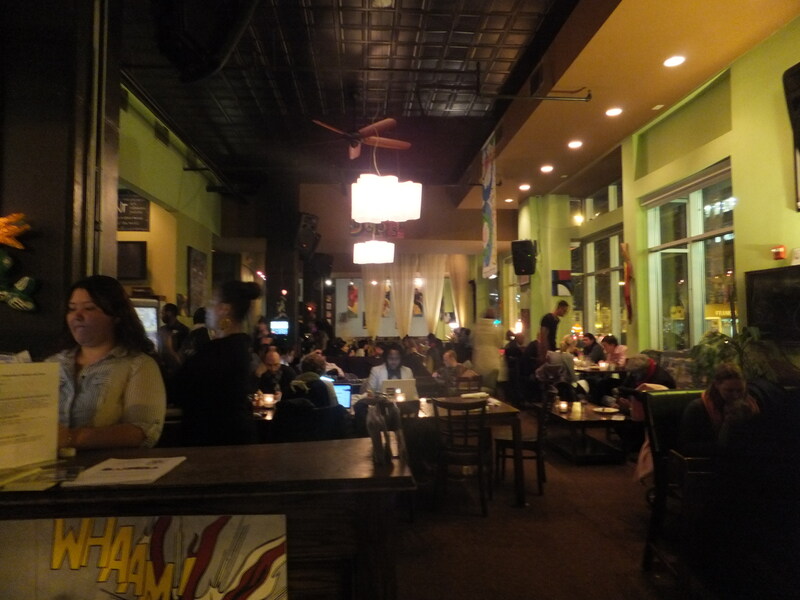 Busboys and Poets, which opened in 2005, is now a local landmark. A celebration of famed poet Langston Hughes, the restaurant seeks to provide a space where the barriers between people can be bridged over good food and drink. Their menu provides enough to satisfy all tastes and is a reliable go-to for a first date or a solid night out with friends. The restaurant is a place to feed the soul as well as the stomach. It houses a unique non-profit bookstore full of hard-to-find progressive literature, as well as a great performance space that has hosted the likes of Howard Zinn. Both DC locations use 100% wind power. Their vanilla and coconut ice creams are from Taharka Brothers, a social business venture that hires young urban men and teaches them business strategy. 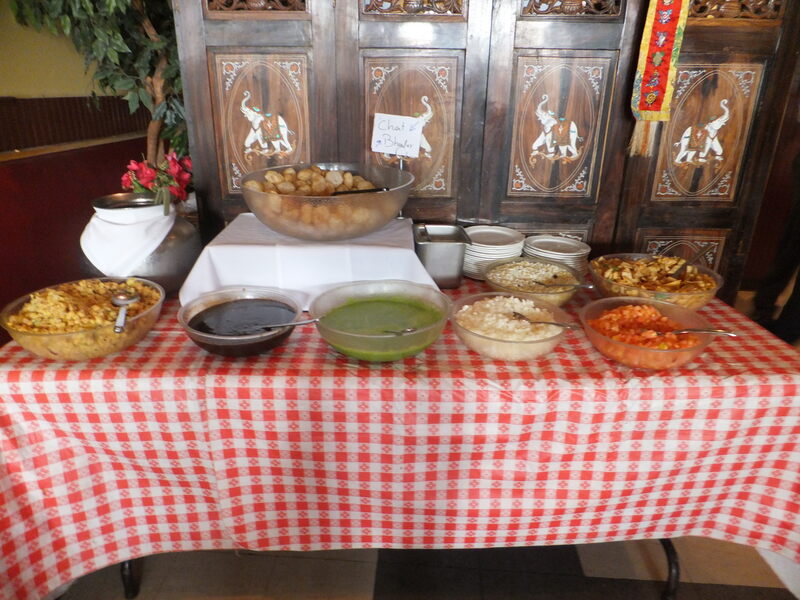 Not surprisingly, there is a wide variety of vegetarian and vegan choices on the lunch and dinner menu. It’s one of the few places where I don’t order the same thing every time (if you’re vegetarian, you might know what I mean). For example, five out of the seven panini choices are vegan or vegetarian, and they offer vegan and vegetarian versions of their tasty nachos. 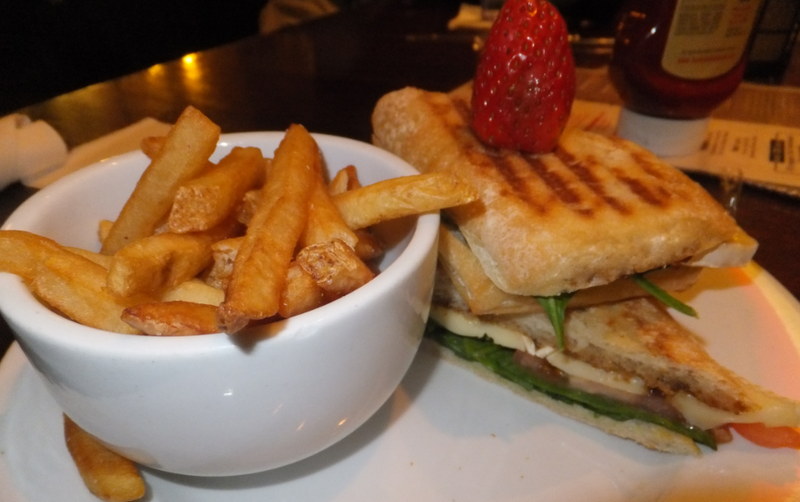 On my last visit, I tried the grilled brie panini with spinach, caramelized onions, and tomato on ciabatta. If you like sweet-savory combinations, definitely go for this one. The onions seem to have been cooked with a good bit of sugar (not my thing; I prefer caramelized onions that have developed their own sugars). I was also a bit disappointed to get floppy shoestring fries on the side rather than the wedge-cut fries they used to serve. My standby is actually the flavorful and satisfying portobello mushroom panini with pesto, roasted red pepper, and fresh mozzarella on herb ciabatta. And for the kid in you, try the peanut butter and banana panini with agave nectar on french loaf. Two of my dining companions chose the excellent house-made veggie burger served with arugula, avocado, and tomato on a wheat bun. 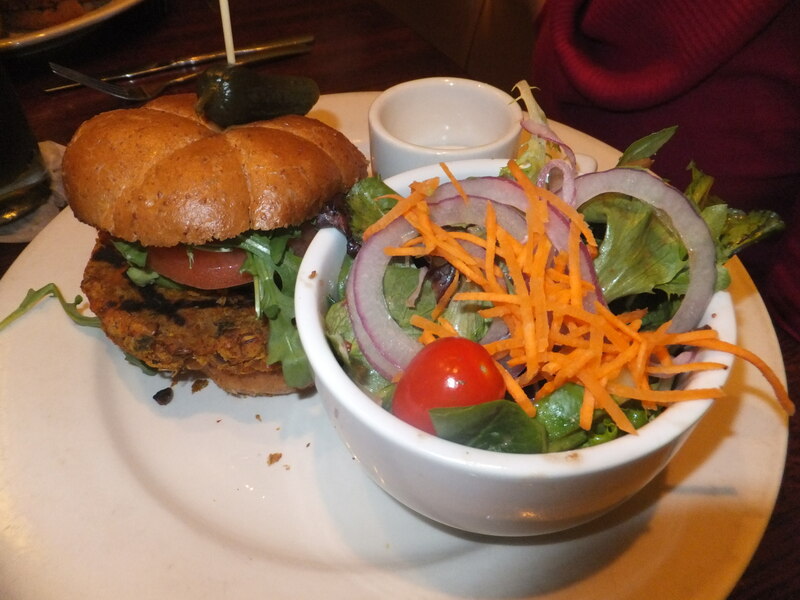 Busboys’ burger features potatoes and tastes of Indian spices. The orzo with sweet potato, asparagus, shallots, shiitake, red pepper and kale, tossed in a tomato olive oil sauce makes a colorful and tasty vegan choice. It benefits from a sprinkle of salt and I can only imagine it with grated parmesan, but the balance of vegetables and pasta is refreshing. 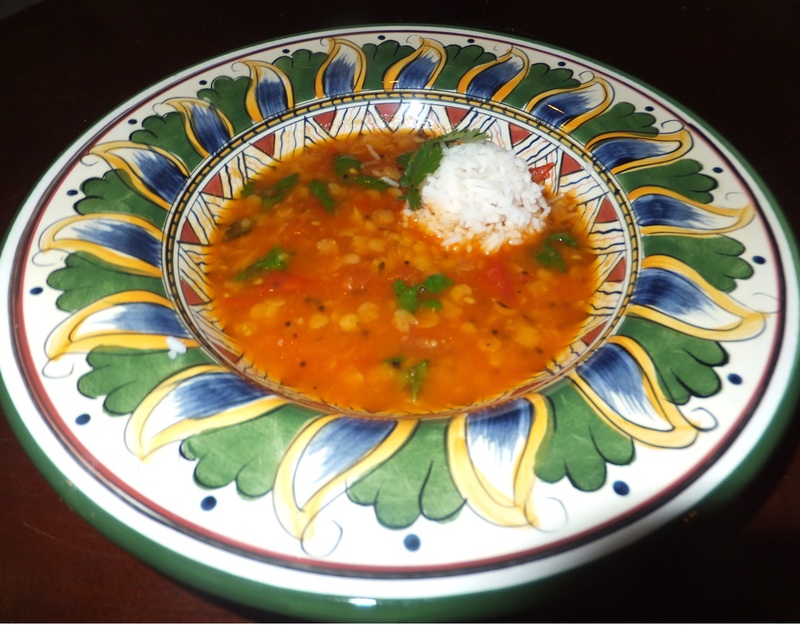 For a light but filling meal, try the subtly spiced harira, a Moroccan bean soup. This way, you’ll have room for one of Busboys’ many delicious desserts (if in doubt, just go for the mini apple pie a la mode). Busboys is popular with late diners so if the wait is too long just head over to Eatonville, their sister restaurant, right across the street.